Having purchased this as a gift, my interest had been piqued and I couldn’t resist picking up a copy from our local library. Although some time since I’d read anything by Sarah Waters, I thought I knew a little of what to expect. While that was the case to a certain extent, I was totally unprepared for what I got. I don’t want to reveal too much. Reviews are widely available, so I’m not giving anything away by talking about the basic premise of the novel. It’s 1922 and the effects of war are everywhere. 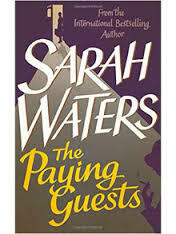 We are quickly drawn into this once genteel environment, on the cusp of great change, as Frances Wray and her widowed mother prepare to open their home to lodgers Len and Lillian Barber, the ‘paying guests’ referred to in the title. Although the first section felt slow at times, I found the attention to detail absorbing and I was fascinated by the way in which Waters immerses us completely in this past world. As the inevitable occurs, I was more taken by the way in which Waters focused on the consequences of these shifting relationships. I certainly was not prepared for the two actions – one planned; the other not – that become so pivotal to the novel. From that moment on this book became something far more appealing and I, literally, could not put the book down.